Dad has a Seiko Automatic from 1971 that Mom bought him new. H e wore it daily for many years, and still wears it occasionally. He worked construction during the summers while in college, and often his watch was the only one on the crew that wasn't fogged up to unreadability. It is probably seeing him with this watch (and its nearly identical quartz replacement) that shaped my view of an elegant everyday watch--Silver-white dial, simple stick markers, stainless steel case. Around 1992, Mom and Dad bought me my own quartz version, pictured here. It was basically abused for 13 years or so--I rarely took it off even to shower or swim. When Mom bought Dad's first Seiko, the brand was fairly new to the US market, although they had made either movements or entire watches for US brands--The top of the line Timex in the late 50's used a Seiko movement. Seiko was brought to the attention of Americans via servicemen returning from Vietnam, and wasn't imported in large numbers until the early 70's. It wasn't a horribly expensive watch, but it certainly qualifies as a good one--I'm not sure there was anything close available in the US at anywhere near the price. Before quartz, good watches were significantly better in almost every way than cheap watches. The movements would keep better time and last longer, the cases would resist water and wear better and they wouldn't have to be serviced as often. If you wanted something accurate and durable, you had to pay. That changed with the perfection of quartz. For all practical purposes, a dime-store watch keeps perfect time--within a few minutes per year, and will usualy withstand more abuse. The dime store watch may not last as long overall, but it will generally last as long as the maintenance interval on a mechanical, and replacement will cost less than a single servicing of a mechanical. Besides looks, what makes a good practical watch today? Most movements are pretty good. Swiss or Japanese are probably the best, followed by other Asian movements made by Japanese companies. As long as you keep them dry, even the Chinese quartz movements will keep time with good accuracy and last years. These are movements in watches that retail for a few dollars. The case has become the most important difference. Ideally, the case will be all stainless, NOT "stainless back, base metal bezel. It should be water resistant, with a rated depth or ATM rating. (1ATM is equal to 10 meters) Technically you aren't supposed to shower or swim in a watch with no depth rating. Unless you are diving, an extreme rating doesn't gain much--generally seals either work or they don't. "Base metal bezel" indicates a brass case, plated with chrome or yellow stuff. Goldtone watches are an exception--it is difficult to plate stainless, so gold-colored watches will be "base metal" to a higher price point. Gold plating or goldtone isn't as durable as chrome, and nowhere near as durable as solid metal. Band material is personal preference. Leather bands don't last forever, but they are easy to replace. I can't wear ordinary leather bands long in the summer before they start to smell funny. Luckily I bought 45 pounds of watch bands from Ebay, and I've still got a few left... Some really nice leather bands have a "deployant" clasp--Instead of a standard buckle, there is a folding clasp like a metal band. Some people say metal bands pull the hairs on their wrists. This depends on the design of the band--Expansion bands are notorious for pulling hair. Most well-designed metal rarely if ever pull hair. Look at the sides--Cheap bands will be obviously folded metal. Better ones will still be folded, but the finish will be smoother--there will be a finishing operation after the links are folded. The best watches use solid links, and solid end pieces. The clasp on a better metal band will have some sort of extra lock--Buttons on the side, or a flip-lock. Notice that in addition to the standard lugs, this watch has 2 extra bits attached to the case, to match the style of the band. That is known as an integrated band, and it means you pretty much can't change bands, or switch from metal to leather. Most mid-grade watches have either flat mineral-glass crystals, or domed plastic. Mineral glass is less likely to scratch, but plastic can be buffed out with trivial effort. Better watches with flat or slightly domed crystals will have sapphire rather than mineral glass. These are very difficult to scratch. There are some features that can be a problem. Many of the "never needs a battery" --Solar (Ecodrive) or rotor-generator (Kinetic, Auto-quartz) add needless complexity, with little benefit on a standard watch. Modern batteries can last 10 years or more, some of the energy cells in the rechargeable watches don't last much longer and are far more expensive to replace. Casio makes a line of "atomic" watches that set themselves via radio. The ones with both analog and digital display can get out of sync--save the instructions. The less expensive Seikos and Citizens are really good values. Pulsar is a cheaper brand of the Seiko company, using the same movements. 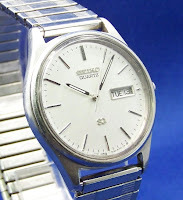 Most Pulsars are base metal, but there are some with stainless cases--These are essentially a Seiko. Casio G-Shocks are among the most durable in withstanding abuse, although their newer models don't have quite the reputation of the early ones. Fossil and Diesel (same company) have neat looking features, but their cases are rarely above average--In fact, some of their cases with snap-on backs are a significant problem, fitting so tight as to be nearly impossible to replace without damaging the watch. It's sad to walk the streets of Waltham, past the old factory. My first watch was a Waltham, in the late 60s. Sic transit gloria mundi. Completely OT, but it seems they found some interesting engraving inside Abraham Lincoln's pocket watch.